“How to get subscribers?” “What videos should I make?” – These are questions YouTube creators ask and search all the time. A lot of online resources give out generic and high level advice like "be yourself" and "make good content". filmora.io, a YouTube creator community, has asked 14 up-and-coming YouTube stars for their first-hand stories and actionable advice on how they successfully grow their subscribers and channels. Today, filmora.io launches its Get Subs 2017 campaign to share all the advice videos along with awesome giveaways that will help all creators grow their channels. From today to August 28nd, filmora.io will release a new advice video daily and a free 14-page Get Subs Guide that includes YouTube tips, worksheets and checklists. All the videos are made by creators from different genres, each of which features one creator’s story on how they grew subscribers. Viewers will walk away with an actionable piece of advice that they can start implementing on their own YouTube channel or even be inspired to start one. filmora.io will also give away one iPhone 8 (yes, it’s an 8! ), one DJI Spark Drone and 10 Samsung Gear 360 Cameras to those who sign up and share the campaign with hashtag #GetSubs2017. 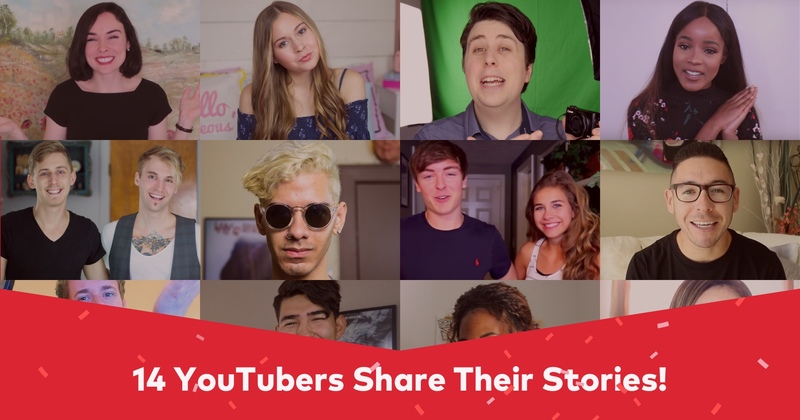 The creator lineup includes 18-year-old vlogger Jack Brinkman, comedian and prankster Paloma Renee, LGBTQ couple Him & Him, tech vlogger SAMTIME, ASMR artist Whisper Latina, beauty and fashion vlogger Linn Moberg, DIY home decor creator ElleToshea and more. “I didn’t get 400,000 subscribers overnight from one viral video,” said 18-year-old vlogger Jack Brinkman in his advice video, “What I did was to find a trending topic that I can relate to. Then I would create a couple different videos on that topic. If one person clicks on one of your videos, it’s bound to have a couple more of your relevant videos suggested for that person. Over time, it will bring in more views and subscribers.” Brinkman makes challenge videos with his girlfriend Gabrielle, and his channel has gained over 400,000 subscribers in two years. “I got my first 1,000 subscribers using a strategy called hustle and heart,” said Adrian Brambila who makes dance videos on YouTube under the name El Tiro. “I would spend hours online watching other people’s dance videos. Then I would comment and give them constructive criticism without asking for anything in return. Eventually, they will check out my channel and subscribe back. I reached out to at least 22 channels every day back in the days.” Brambila’s channel now has over 87,000 subscribers. 2017 marks the 10-year anniversary of YouTube’s partner program – the first program that lets creators get paid for their viral content and even make YouTube their full-time careers. Over the past decade, we have seen the increasing fame and wealth some of the YouTube superstars gained. However, to new creators who just start on YouTube, being a celebrity is rarely one of their immediate goals.